As you may imagine, I spend a lot of time talking about real estate with people. Some of the most common questions I hear is “how’s the market”, “where’s the best place to buy” and “what markets are hot“. These are all questions that, in the firm I’m a partner in (MORE, Realtors), we go to great expense and effort to provide answers to. We pride ourselves on having the most current and accurate market data as well as in our ability to dissect the data, apply it to the local market and to a clients situation or transaction to insure it’s a successful transaction from all aspects. 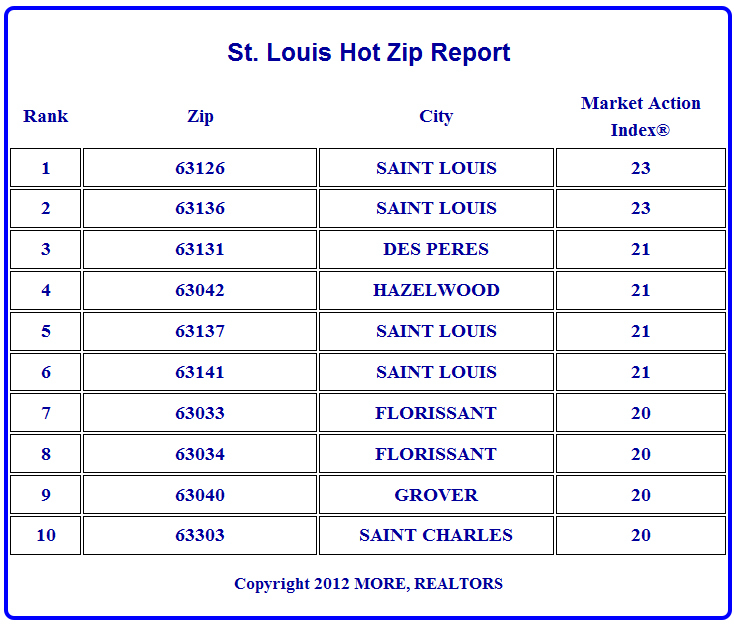 With this in mind, we have just introduced 3 new reports that I think many people will find interesting and informative, one of which (shown below) is a real-time chart that shows the “hottest” real estate markets in St. Louis.